We’d love your help. Let us know what’s wrong with this preview of The Mover of Bones by Robert Vivian. To ask other readers questions about The Mover of Bones, please sign up. I found this to be the most difficult story thread to follow ever! It left me frustrated most of the time. However, it also kept me wondering so I would go back and read some more....I ams ending it to a friend who is a AVID reader...I need a second opinion! 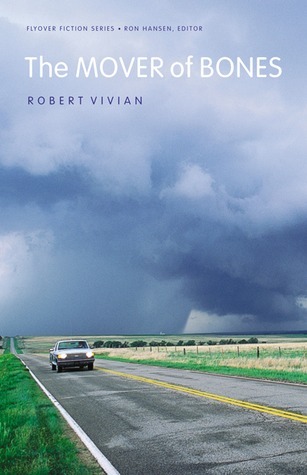 The Mover of Bones Robert Vivian's first novel of his "Tall Grass Trilogy" (followed by Lamb Bright Saviors (2010) and Another Kingdom Burning (2011) both from U of Nebraska Press), is an interesting book. I know that's not a particularly good descriptor, but Vivian's work is difficult to categorize--which isn't a bad thing. To say what The Mover of Bones is about or to describe its plot isn't all that easy. On the surface the novel is about how Jesse Breedlove, a man we ultimately don't know a The Mover of Bones Robert Vivian's first novel of his "Tall Grass Trilogy" (followed by Lamb Bright Saviors (2010) and Another Kingdom Burning (2011) both from U of Nebraska Press), is an interesting book. I know that's not a particularly good descriptor, but Vivian's work is difficult to categorize--which isn't a bad thing. To say what The Mover of Bones is about or to describe its plot isn't all that easy. On the surface the novel is about how Jesse Breedlove, a man we ultimately don't know a lot about except that he's a janitor, digs up the bones of a murdered young girl who was buried in the cellar of an old Catholic church in Omaha, Nebraska, and takes her on a road-trip of sorts across the United States. But the novel isn't told in a conventional way; it's made up of 18 first person monologues, each in distinctly different voices (Vivian has written and had produced many plays, so this isn't a stretch for him), by the people who encounter Breedlove and the bones of the young girl in their travels. The voices we encounter are from people on the fringes and margins of society, and often their encounters with Breedlove offer them a kind of momentary salvation from their lives. The story is interesting in that there are far more questions than answers: who is Jesse Breedlove - some kind of Christ-like redeemer, or someone who is sick and twisted? Why was the girl murdered and buried in the church? Who killed her? What becomes of Breedlove and the girl's bones? Why does Breedlove decide to become "the mover of bones"? Vivian doesn't succumb the pressure to answer these and other questions. He lets his characters speak to us in their own voices, and in that way he gives them life on the page. Ultimately the novel is a collage of sorts, a collection of voices that each paint a picture of a life lived in this country. It's a study of how to use myriad voices to create a strangely unified whole. The writing is lyrical and poetic, and in many ways almost fantastical. There are moment in the novel that border on magical realism, but I don't think that describes what Vivian does properly. The "magical" moments are grounded in the spiritual - perhaps is should be called "spiritual realism" - but this isn't a "religious" novel; it doesn't proselytize or try to be polemical in any way. In a way, the novel is far bigger and grander than that, even in its scant 159 pages. If you're looking for a more traditional narrative structure, then this novel probably isn't for you. However, if you're interested a novel that experiments with voice and structure, then I think you'll find The Mover of Bones very satisfying. Janitor Jesse Breedlove digs up the bones of a murdered girl in the basement of a church. Why is he doing it? Is he going to find the murderer? Will he find her family? These would be the questions answered in an ordinary novel but “The Mover of Bones”, thankfully, is no ordinary novel. Instead Breedlove gently puts the bones in the back of his pickup truck and goes on what one character calls “a rock-n-roll tour” traveling across the country where he encounters a variety of people, many living Janitor Jesse Breedlove digs up the bones of a murdered girl in the basement of a church. Why is he doing it? Is he going to find the murderer? Will he find her family? These would be the questions answered in an ordinary novel but “The Mover of Bones”, thankfully, is no ordinary novel. Instead Breedlove gently puts the bones in the back of his pickup truck and goes on what one character calls “a rock-n-roll tour” traveling across the country where he encounters a variety of people, many living on the edge of society who seem destined to meet Breedlove and his mysterious cargo: bones “excavated so that others could feel the shock of her purity.” The novel is told through the voices of the 16 people who are touched, soothed, helped, and healed as a result of their Breedlove experience. I highly recommend this book but with one note of warning: this is a book that will challenge you. Several of Vivian’s characters take hard looks at the world, describing what may very well be the experience of your own everyday existence, and they ask, “What the f*** are we doing here?” If you recognize that question, if you realize what these characters are talking about is within you, how in the world will you answer it for yourself? Phenomenal. A book my favorite college professor and one of the most interesting human beings I have ever met, Vivian can't help but paint images that will burn into retinas and he demonstrates extraordinary capability in capturing the mentality, the perspective, and the voice of a wide variety of individual walks of life, full of insightful thoughts as characters are examined: the gambling addict in Vegas who is dying to return home; the abused housewife who fears discovery from the man she's s Phenomenal. A book my favorite college professor and one of the most interesting human beings I have ever met, Vivian can't help but paint images that will burn into retinas and he demonstrates extraordinary capability in capturing the mentality, the perspective, and the voice of a wide variety of individual walks of life, full of insightful thoughts as characters are examined: the gambling addict in Vegas who is dying to return home; the abused housewife who fears discovery from the man she's still attracted to but has finally left; the 16-year-old who turns her back on the family and her world and walks away; the 31-year-old mentally handicapped man who sets fire to his mother's couch after witnessing her fornicated on it, understanding only that "that fire is how I felt inside"; the Right-To-Life demonstrator outside an abortion clinic. from the beginning this book was more than a story about a drifter, a drunk, or a criminal - it was mythic and mystic. what vivian did was craft a series of characters who were more like embodiments gifted into existence by the bones of a dead girl. but even that is not quite right, because he writes secret poems in between the lives he tells in lines. "the breeze came in softly ... like a piece of cotton dipped in hope." i couldn't stop and read it in one sitting. I have given this book to 6 people - it is a heavy journey indeed for such a small book. The chapters are tiny, ranging from 1 to a few pages - but the words and thoughts are rich and fatty - giving the reader a good dose of literary gout. It is definite any reader will be able to relate to at least one of the characters in the book - a truly tragic story which fills you up and lightens your load. It took me two tries to start this novel, of which Jesse Breedlove is the least interesting part. What really captured me is the lyricism of the language and the sympathy with which even the most disturbing characters are rendered. Jesse may offer redemption, but these are people are who have to make their own. Highly readable prose doubles as powerful poetry. So intense and fraught with meaning I needed to read it in small doses in order to properly savor the majesty of this author's craft. This man is an incredible writer. Nothing I can opine can adequately tout the literary perfection of this book. Amazing! Love Vivian's work, but I enjoy his essays more than his novels. I'm biased, though. are simply wonderful both in content and style. Beautiful, haunting, truthful, and original. Vivian paints America in all its light and darkness. It's the heartland counterpart to Selby's Last Exit To Brooklyn. Robert Vivian's is an incredible stylist with vivid and urgent imagery.